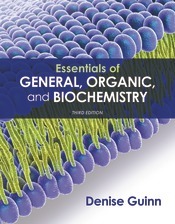 Guinn’s Essentials of General, Organic and Biochemistry uses health and medicine as the framework for learning the fundamentals of chemistry in this student-centered one-semester text. The newly revised 3rd edition focuses on core concepts and necessary math skills, and features a revamped organization to align with traditional course organization and shorter, more condensed chapters. Easily digestible content and medical applications help reduce student anxiety and make chemistry meaningful for students preparing for future careers in nursing and other allied health professions. Paired with SaplingPlus and an embedded eBook, students will be able to focus their study with adaptive quizzing and understand the relevance of chemistry through videos, animations and case studies.